For friends, musings, restaurant reviews and travel news. 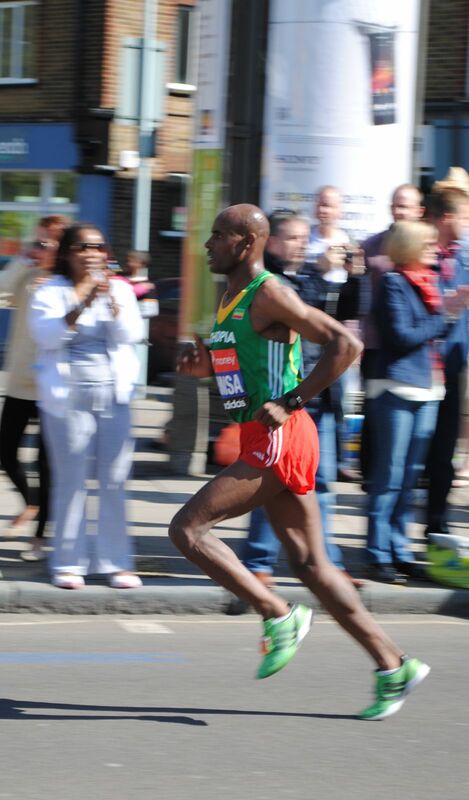 Despite living close to the course of the London Marathon, Sunday was the first time that I watched the event live. 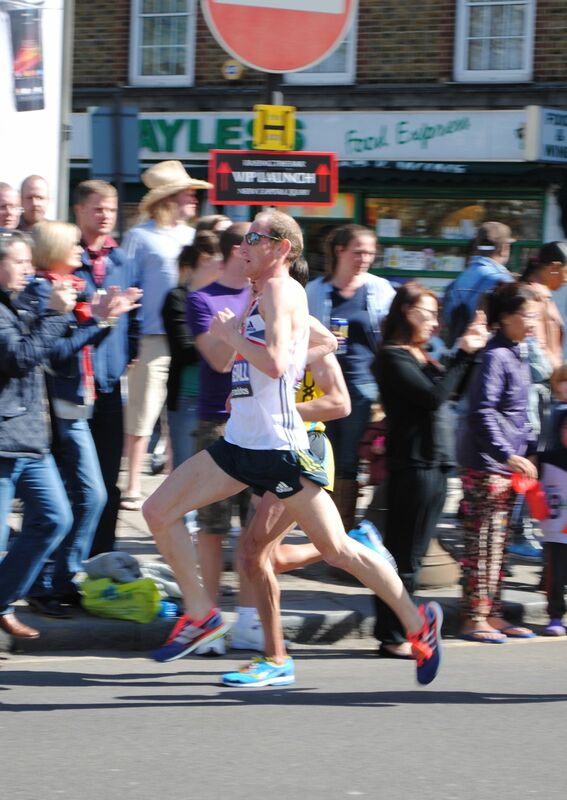 I was keen to support friends from Kent AC that were running on the day, and also to see the elite men race pass. We headed to Deptford as I liked the idea of being close to home, and I was hoping that the crowds wouldn't be too deep at this part of the course. Luckily we managed to secure a sunny spot against the barriers, an almost perfect viewing location. The first athletes we saw were the tail end of the wheelchair race (the elite women and wheelchair athletes had passed by the time we arrived). Several of the wheelchair athletes looked like they were struggling and I feared it was going to be a long day for them to get round! Next to come past were the disabled athletes. I received an email during the week saying that one of the guides for a partially sighted athlete had dropped out and was I able to volunteer to be their guide. They were hoping to run between 2hr 50mins and 3hrs which ruled me out! I did a double take when I saw my friend Paul jog past guiding. Stepping in to run a 3hr marathon with three days notice is amazing. When you add in the responsibilities of guiding for the first time, it becomes even more fantastic. After the disabled athletes came the elite men's race. 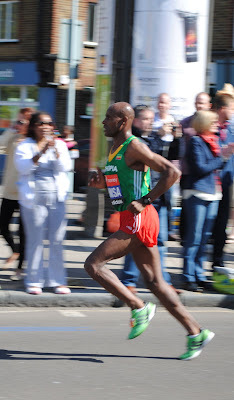 I was really looking forward to seeing Mo and the rest of the elite men run. In reality they were gone in a flash. I couldn't recognise which one was Mo and didn't have time to take in any of their technique. A bit of a disappointment really! Shortly after the elite men were the top club runners. I was looking out for seven / eight friends from Kent that I train with. John shot through, red cheeked and looking like he was giving it maximum effort. I knew John was a good runner, but was surprised to see him so far up. Next along came Phil, Paul, Stu and Dan. I gave them all a big cheer and they all smiled back. I know from experience that it is great to hear someone cheer you on. It only provides ten seconds distraction from the pain. But those ten seconds are priceless! After the club runners we stayed for another half an hour to watch some of the fun runners come through. My only celebrity spot was Michel Roux who passed just in front of us. I don't know how the army carry their Bergen's round the course. When I got home and checked the race results. John had come SECOND in the mass participation event. If he was taking part in the elite competition he would have come 15th and was the second fastest Brit. That's unbelievable. A great hour in the spring sunshine. It definitely won't be my last time watching the London Marathon. How can you have a $10 wagyu burger?